An Introduction to this Series on the years 2009 – 2012 in conflict in Pakistan can be read here. This section deals with data available on Punjab and Sindh. Compared to the other provinces, incidents here have been rather few and violence is largely focused on the large urban areas. Hence only the annual scale is looked at. However, with terrorist networks spanning into and originating from these two provinces, a more detailed analysis into linkages to violence elsewhere needs to be attempted at a later stage. You may also want to read on where we see the limits of such an analysis and to what extent we are qualified in this field. All Data is from the SATP Portal. The numbers of violent incidents and the number of people killed and injured is lower in the most populous provinces of Punjab and Sindh, especially if leaving the urban war in Karachi out of sight. 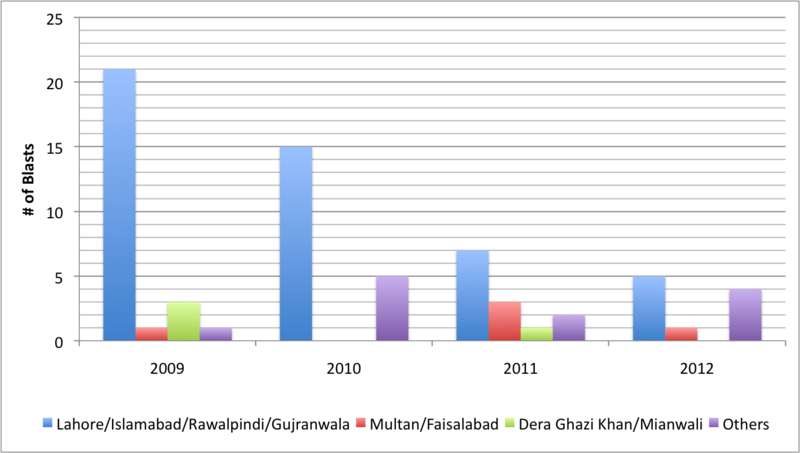 Nevertheless, these provinces are closely linked to violence elsewhere, as Ayesha Siddiqa shows for the Punjab. A closer look at these links in terms of how that affects numbers of incidents is beyond this work at the current point. In both provinces attacks are mainly happening in the large cities. We have therefore grouped Punjab into North (Lahore, Rawalpindi, Islamabad, Gujranwala), Center (Multan, Faisalabad), South (Dera Ghazi Khan, Mianwali) and Others. This is not to suggest that attacks in these areas have been carried out by the same outfits. A more detailed look has not been attempted so far. 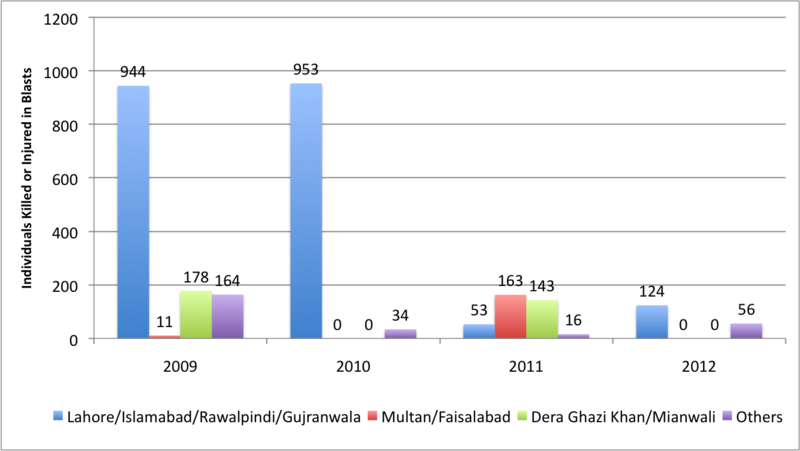 Incidents in Punjab have significantly decreased in recent years (see Figure 1), solely due to a decrease of attacks in Lahore. In the other areas there is no significant trend. 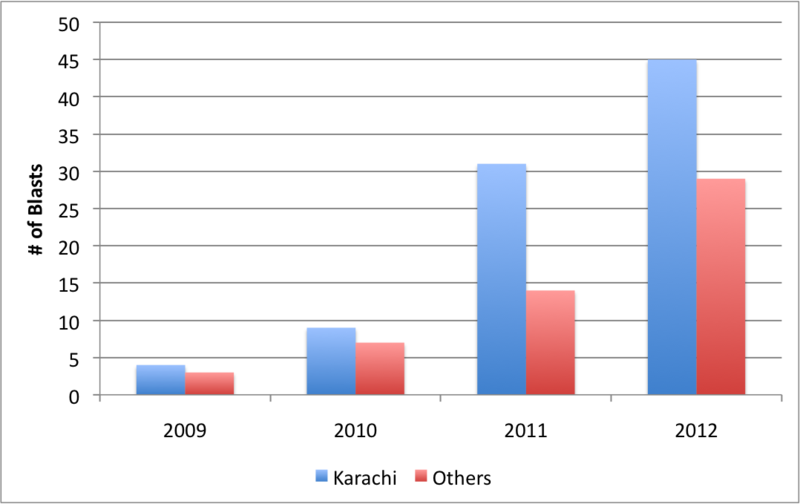 To the contrary, the number of attacks in Sindh have risen steeply in recent years – both in Karachi and elsewhere in the province (see Figure 3). However, this is largely due to the fact, that the number of small bomb attacks have increased. 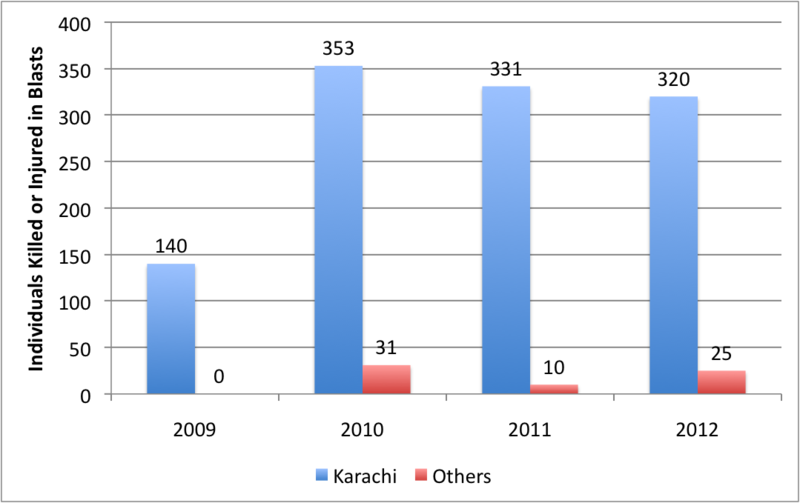 The numbers of people killed or injured have stayed stable around 300 per year, most of them in Karachi (see Figure 4).